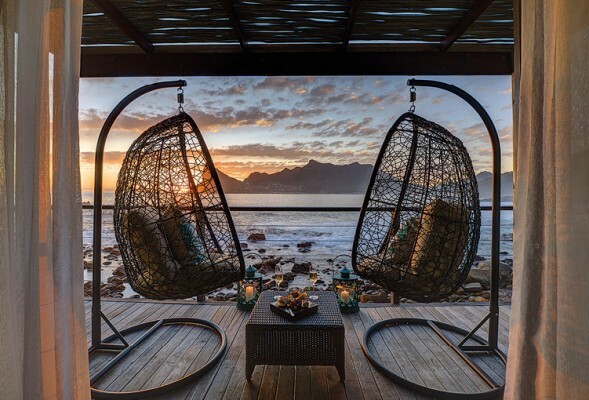 Corbett has always had an eye for opportunity and has cashed in on the tourism boom in South Africa with his Tintswalo branded boutique luxury safari lodges, manor houses and the crown of their collection, Tintswalo Atlantic, nestled under the watchful eye of Chapman’s Peak. The wooden lodge is perched on a pebbled beach and enjoys panoramic views of the picturesque Hout Bay Harbour, the dramatic Sentinel mountain peak and the Atlantic Ocean beyond. But it was not always plain sailing for the 5-star lodge, with the ravenous wildfires of 2015 destroying much of what Corbett had dreamed of at the start of project some 12 years ago, when he threw a pebble into the ocean and made a wish—a wish that would turn into reality three years later when they opened the doors in 2008. “Yes, what’s interesting about that, it was a gigantic loss but as we walked down the hill and looked down onto this wreck, my wife very, very perceptively said any situation that we can’t get on top of is going to beat us, we’ve never given up on anything, we’re not giving up, this is an opportunity to grow, we’re going to build it bigger and better. That was a bright idea and that’s what did it,” he says. Corbett is in touch with nature and always wanted to ‘paint a picture’ that would blend into the natural beauty of the area, unlike some of the gin palaces along the coast that ruin the natural vistas of the area with ugly concrete box designs, which lack any imagination and natural aesthetics. “When we took it over, that concession was originally won by another group and it’s a long story but we bought it from them. They were going to build something there that would have looked a little bit like a Holiday Inn, their plans had these tiered roofs and 60 rooms. “And we said, ‘look not a chance’, but part of the criteria was that you had to, at the end of the period of the concession, literally pick it up and walk away, so it had to be wood. And that was 12 years ago,” Corbett explains. You’d imagine that it would be difficult pouring a lot of money into a property that you might not have down the line if the concession from the parks board was not reviewed, as it falls in protected land. But the romantic in Corbett was willing to take the risk just to have his dream realised. I had to agree, there is definitely a certain je ne sais quoi about the place, a natural energy from the mountain and the sea that makes it a memorable place to visit for a weekend, or just for lunch at their fine dining restaurant. As a leader of an establishment with such high standards, it is essential that your staff is well trained and passionate about the brand that they are servicing. Poor leaders tend to micro-manage or don’t provide enough vision for people to work towards. “We focus attention on an ingredient that’s very difficult to define, it’s like a spirituality, the Afrikaans word is ‘houding’—it might be close to it. It’s very difficult to describe, but we’ve surveyed our public, fairly often, to discover what is it that sets us apart, in all our lodges. The one ingredient that we’ve identified is this spirituality. There’s good service, there’s good food but it’s something different, it’s uniqueness,” he says. There is a certain degree of mystique around the property, like it’s telling a story when inviting people into its establishment. It is a family-run business, with Corbett’s wife, daughter and extended family being involved, and that feeling of warmth comes across. But Corbett, who lives in the fast-paced city of Johannesburg, managing his lucrative business affairs, did a remarkable thing early in his career—he packed up his whole family and moved to a small holding outside of George in the Garden Route to live off-grid and be able to appreciate time with his family. “Yes, we said goodbye to the real world and we all rode horses, grew our own vegetables and made our own butter. Now and again on a Monday, I’d say to my kids, ‘We don’t have to agree with man’s calendar actually, we can have our own, today is not Monday, it’s Sunday’, and we’d go to the beach,” he enthuses. But all good things must come to an end and Corbett needed to relocate to the Big Smoke to support his family. “We were owed lots of money, which never arrived, so we had to pack up and go to Joburg, what else do you do? I was 42, I had three kids and was a complete financial failure,” Corbett says. Although he was in financial dire straits, he was a success in other areas. “Yes, the family was very strong,” he says. 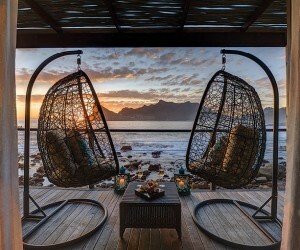 But it did not take the serial entrepreneur long to get back on this feet, establishing himself as one of the premier tourism developers in South Africa with his unique, sustainable approach to developments. Corbett is very much an adventurer at heart, having competed in rallies around the world, and he currently supports his son’s successful off-road racing team. He is a petrolhead through and through, and even helps produce their own original off-road racing truck, that punches one hell of a punch. But sadly, with political turmoil on the Dakar route through Africa, it seems the event will be staged in South America for good now, which does not suit their car, which is designed for more pure desert racing. He says, “I do prefer the African event. What happened with Dakar, the year before last we did it, it was a very bad race for us because our car is designed for completely off-road desert conditions and unfortunately, of those 40 days, about seven/eight were, in fact, rally stages. We didn’t do well, and it really pissed us off big time, so now we’re not doing Dakar the end of this year, we’re going to do the Silk Way Rally”, which starts in Xi’an and finishes in Moscow. He also loves nothing better than spending his Christmas holidays camping in the bush, far away from the hustle and bustle. It is refreshing to see a wealthy family still enjoying the simple things in life. “Every single Christmas, we would take five weeks, an old Land Cruiser, the kids and disappear into Botswana or Namibia. Each kid had a very specific role to play and they would have to make sure the dishes were done, for example. We’ve done that all our lives and they always had to make their Christmas presents, not buy them,” Corbett says. It must warm the cockles of his heart to see his youngsters enjoying the great outdoors. “Ah, that’s my passion. “I was never very academic, so I had some limitations and my parents were very poor so I’ve always believed that it’s adventure that kindles the spirit and gets the action going,” he says. Conservation is close to his heart and he is also involved in the Rhino Anti-poaching. Are we getting on top of that epidemic? “Probably the most successful thing we’ve ever done is, we started a programme at Safari Lodge where we go to the schools and we bring kids in over holidays. We take them on game drives, we take them on foot and we get them to understand the significance of the Big Five, what it actually is and why it is important. They realise that people come from overseas, pay top dollar to see Big Five, rhino in particular, which then means that their families can have a job. Then we explain if you see somebody who is suddenly driving a Mercedes who’s previously had a Toyota please tell your parents and tell the police. With that action, which has been going now for nearly 18 months, we’ve probably, I don’t know the exact figure, but probably apprehended about nine poachers,” concludes the charismatic Corbett.